In the aftermath of the August 21st Sarin attack in Damascus, videos and photographs of the remains of an unusual type of munition were posted online from various impact locations in Eastern Ghouta. These munitions were largely unknown at the time, but since August 21st an ever increasing amount of information have been gathered about them, which both provides clues to their origin, and who was responsible for the August 21st Sarin attack. It wasn’t until weeks after the August 21st attack that the name for these munitions used by the Syrian military was known, “Volcano” rockets. Nearly all of the information collected on Volcano rockets was gathered through open sources, such as YouTube, Twitter, Facebook, and various news sites and forums. The first images of the rockets used in the August 21st attacks were posted on now deleted Facebook pages belonging to local groups in Eastern Ghouta, and were quickly followed by videos showing multiple examples of the rockets. 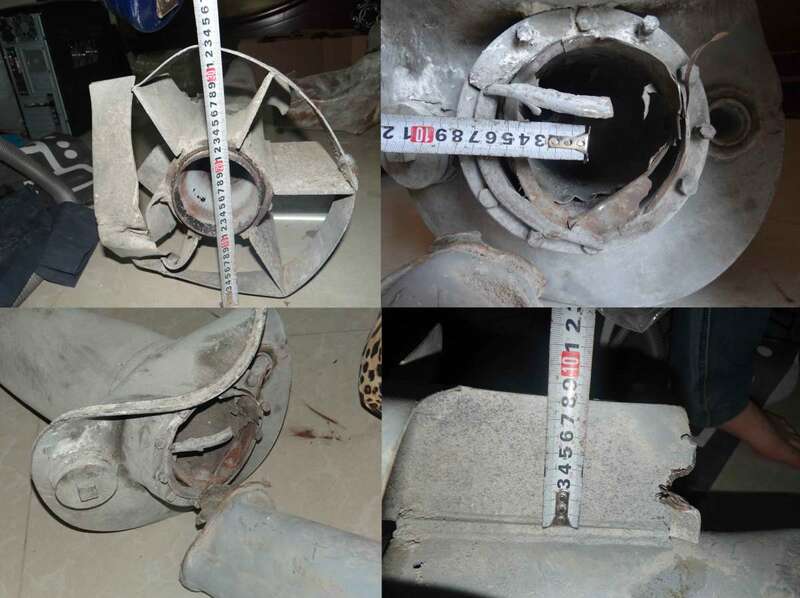 While generally unknown to arms and munitions specialists, examples of the remains of the same munitions had appeared in videos and photographs posted by activists going back to early 2013. Only a couple of weeks before the August 21st attacks, the remains of three of the same type of munition had been filmed in Adra, Damascus. The remains of the same type of rocket had also been filmed in Adra in June 2013, Daraya, Damascus at the start of the 2013, and again in Daraya in December 2012. Because the name of the rockets, were unknown they were at first described at UMLACAs (Unidentified Munitions Linked to Alleged Chemical Attacks), but after several weeks the name was established as “Volcano”. – The remains of the munition were fairly intact, especially the warhead section, strongly indicating the payload was not explosive. – The base of the warhead had a port that was clearly a fill port for whatever was contained in the munitions, strongly suggesting it was a liquid (for example, Sarin). – The end of the warhead had damage suggesting a small bursting charge was used to disperse the contents of the warhead. – The outer casing of the warhead had been pre-weakened, suggesting it was designed to come apart with a small bursting charge. This was later confirmed by the September OPCW/UN report which detailed evidence of Sarin, and related chemicals, on the rockets and around the impact sites. – A smaller explosive type based on 107mm rockets, with a range of a few hundred meters. – The type used on August 21st, based on a 122mm rocket (as used by the BM-21 Grad multiple rocket launcher), which had both a chemical and explosive warhead. – The largest type, which looked virtually identical to the 122mm type, but used a 220/240mm (the exact size has not yet been established) rocket, and carried a payload of several hundred kilograms. The unexploded remains of the 107mm type had been identified in late 2012, and it’s possible these were introduced to the Syrian military by Hezbollah or Iranian advisers. In early 2013, during the battle of Qusayr, the first “official” involvement of Hezbollah in front-line combat, 107mm Volcano rockets were used widely, with Colonel Aqidi of the Free Syrian Army describing their devastating ability to destroy entire buildings in an interview shortly after opposition forces retreated from Qusayr. According to Elijah Magnier, an al-Rai journalist embedded with government forces using Volcano rockets, the larger 122mm and 220mm Volcano rocket were developed by the Syrian military who were impressed with the destructive power of the smaller 107mm type, and their effectiveness in urban combat. The first images of the rockets were posted online by activists in Aleppo in November 2012, and a series of videos from the government controlled Mezzeh airbase, in southwest Damascus, filmed in December 2012 showed multiple examples of the rockets being launched towards the opposition controlled suburb of Daraya. However, in all these cases there were no reported chemical attacks linked to the use of Volcano rockets, and other video and photographic evidence pointed to the existence of a high explosive version of the rocket. Videos from Damascus and Homs shows the nearly complete remains of a Volcano rockets with a warhead filled with yellow, high explosive powder. Had this exploded, the entire rocket would have been destroyed, so clearly this was different from the chemical type of rocket used on August 21st. Since the August 21st attacks in Damascus, most of the new evidence on Volcano rockets hasn’t come from the Syrian opposition, but the Syrian government. One video, posted by the Syrian National Defence Force on their official YouTube channel in October 2013 showed the clearest view of the largest type of Volcano yet. Other videos and photographs from various pro-Syrian government sources have clearly established the Syrian government as the operators of these systems, and now Hezbollah has been pictured using the systems inside Syria. It’s now been possible to calculate the approximate range of these munitions thanks to the increasing body of video and photographic evidence. The 122mm type of Volcano is believed to have a range of around 2-2.5km, while a March 2014 video showing the 220 type shows it has a range of at least 2.7km. The smaller 107mm Volcano rocket has a much shorter range, measured in hundreds of meters, and has been shown being fired from building to building, making it a devastating weapon for urban combat. Over the past several months it’s become clear Volcano rockets are playing an increasing role in the Syria government’s war efforts. Videos from the Barzeh offensive in Damascus showed 107mm Volcanoes being used widely, forcing a ceasefire between opposition and government forces, and the large Volcano rockets have been used widely in the Yabroud Offensive. The development of the Volcano rockets has allowed the Syrian military to adapt to a form of warfare they weren’t prepared for, and this has made them a much more effective fighting force in the type of urban combat they face on a daily basis. It seems that this is one military development that could have significantly changed the direction of the conflict on the ground in the favour of the Syrian military. Eliot Higgins is the founder of Bellingcat and the Brown Moses Blog. Eliot focuses on the weapons used in the conflict in Syria, and open source investigation tools and techniques. Enter your email address to receive a weekly digest of Bellingcat posts, links to open source research articles, and more. BS – DISINFORMATION to discredit the actual evidence nailing the MONSTER ASSAD of SYRIA. You are probably already aware, but these weapons have long been used by Shi’a militias in Iraq – where they were referred to simply as IRAMs (improvised rocket assisted mortars). During the US occupation Ket’ab Hezbollah would drive a truck to within a km or so of large US bases and fire 4 or 5 of these monsters off.